The Boston Consulting Group (BCG) has jumped six spots to number two on FORTUNE's "100 Best Companies to Work For" list this year, making it one of only two firms to be ranked in the top dozen for six straight years. For the past five years, BCG's position on the Best Companies list has fluctuated between number 3 and number 11. The firm has been ranked the top small company three times before and has been in the top 10 overall three times before. The only other company to be ranked in the top 12 for six consecutive years is Wegmans Food Markets. No other consulting firm has appeared above 44th place since 2006. Capgemini, a global leader in consulting, technology and outsourcing services, has announced the acquisition of German information technology services provider CS Consulting GmbH from its previous owner LRPC, a fund managed by Süd Beteiligungen, a private equity arm of Landesbank Baden-Württemberg, founder Berndt Blumenthal and Dr. Kurt Rommel. The agreement was signed yesterday under conditional approval by the relevant anti-trust authorities. The acquisition will more than double Capgemini's market share in IT services for banking clients in Germany. CS Consulting is an IT consulting firm that specializes in the banking and insurance industry. Founded in 1984, the firm has consistently chalked profitable growth above the market average. In 2009, it generated EUR 47.4m in revenue. CS Consulting employs more than 400 experienced consultants and specializes in migration of core banking systems and business intelligence systems implementation. It is a leader in IT consulting and system integration in Germany, known for its innovative solutions and ability to develop complex applications for its clients in the banking sector. Olivier Sevillia, Member of Capgemini Group Executive Committee, said, "The service portfolio and company culture of CS Consulting, which focuses on reliability of services, independence in terms of consulting and strong collaborative client approach, fit perfectly with Capgemini. With this step, we are giving a clear signal for the further growth of our business in Germany." Berndt Blumenthal, CEO of CS Consulting, said, "Joining Capgemini will enable us to benefit from the experience of a truly international Group with a solid delivery network, and to offer promising perspectives to our employees. We will combine our strengths to serve German banks expansion and transformation." Ernst & Young, a global leader in assurance, tax, transaction and consulting services, is the top ranked consulting firm in the Operational Risk & Regulation's annual rankings. This is the second successive year that they named Ernst & Young top consulting firm. The company was ranked top in six out of 12 categories that were included in the rankings. Hank Prybylski, Global Financial Services Risk Management Practice Leader and Americas Financial Services Advisory Leader, said, "Demand for consultancy services has increased in this era of regulatory change, and in turn, we have seen a continued up-tick in demand worldwide for advisory services across asset management, banking and capital markets, and insurance sectors. Being recognized by Operational Risk & Regulation as a top financial services consulting organization demonstrates Ernst & Young’s commitment to stay ahead of the changes the industry faces and address the evolving needs of our clients." He added, "As our clients come out of the financial crisis and look at how they will improve business processes — and, ultimately, gain a competitive advantage — we will work with them on defining and implementing business strategies that are consistent with the emerging regulatory landscape." To view the full Operational Risk & Regulations consultancy rankings, please visit www.ey.com/us/financialservices. To browse and apply for the latest finance consulting jobs, visit Consultancy Role Finder. Global consulting and accounting giant Deloitte Touche Tohmatsu Ltd. and Roland Berger Strategy Consultants are discussing a possible merger. In a conference call yesterday, Deloitte Germany Chief Executive Martin Plendl told the press that the two companies would make a decision by mid-December, which is when both companies’ shareholders meet to decide on the deal. Deloitte’s takeover is expected to create a global strategy consulting arm that would earn about $2.8 billion in revenue each year, explained Plendl. The merger will combine Deloitte’s operations, strategy and company restructuring consulting divisions with Roland Berger, and the merged company will be called Roland Berger Deloitte Strategy Consulting. Deloitte Touche Tohmatsu is based in New York and has about 170,000 employees globally. Its services include tax, audit, consulting and financial advisory. In 2010, Deloitte's global revenue totalled $26.6 billion. Roland Berger was founded in 1967 as a consulting firm specializing in marketing consulting. Today, it is a versatile consultancy well known for its business and management research and studies. Last year, the company employed about 2,000 people in 27 countries and made 616 million euros in sales. Consulting Magazine has released its annual rankings based on a survey of close to 8,000 consultants employed at 200 consulting firms across the globe. Bain & Company, The Boston Consulting Group, and North Highland were the top ranked large firms this year. Bain & Company took the top spot in several categories: The Job, Career Development, and Work/Life Balance, and it came in second in the Culture, Leadership, and Compensation/Benefits Satisfaction categories. It was also the top rated firm for Strategy in the The Best Firms By Service Line 2010 ranking. For the complete list of firms across the categories, go to ConsultingMag.com. 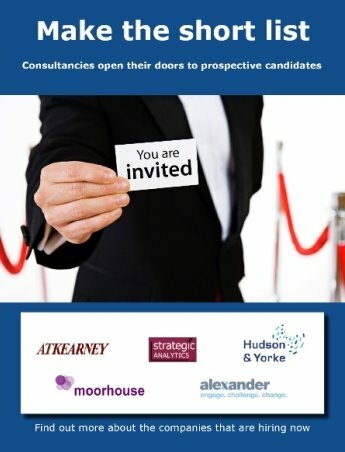 Find the latest consulting jobs on ConsultancyRoleFinder.com. Visa Consulting and Analytics (VC&A), Visa Europe's advisory practice, has been awarded membership of the Management Consultancies Association (MCA), the representative body for management consultancy firms in the UK. VC&A joins a prestigious roll call of 55 MCA members which includes Accenture, Deloitte, PWC, and KPMG. Established in 2006, VC&A has rapidly established itself as a payments consulting business, helping clients across Europe to improve their commercial results by getting the most out of their cards and payment systems. With pan-European and global experience drawn from across the payment card industry, VC&A consultants deliver proven capability, strategic planning and hands-on implementation of innovative and value creating payment solutions. Peter Ayliffe, President of Visa Europe, said "We are proud that Visa Consulting and Analytics has fulfilled the MCA's stringent entry criteria in order to become a member. In less than five years, Visa Consulting and Analytics has established itself as a leading provider of consultancy services, helping our customers to get the most out of their payments businesses. VC&A is committed to helping their clients drive business growth by effectively transferring our knowledge so that they have a clear understanding of how to improve the performance of their business. Membership of the MCA is a clear recognition of the quality and value our customers place on our excellent service". "We are delighted to welcome Visa Consulting and Analytics to membership of the MCA," said Alan Leaman, CEO of the MCA. "MCA members benefit from the badge of quality that membership and our rigorous Code of Practice provides enabling buyers of consultancy to purchase their services with confidence. We also look forward to working with Visa Consulting and Analytics in our role as the representative voice for the industry." Employment and careers portal Vault.com released the 2011 prestige rankings for consulting firms - The Vault Consulting 50 - in late August in an attempt to determine the best consulting companies to work for. The rankings were determined by a formula that factored in the results of Vault's Management and Strategy Consulting Survey, conducted annually between March and July. More than 4,500 consultants were asked to rate the prestige of their peer consulting firms on a scale of 1 to 10 as well as their own firm's quality of life. "We went out and asked consultants what mattered most to them in choosing an employer and prestige, while important, was not the biggest determining factor," said Brian Dalton, managing editor at Vault.com. "According to consultants, company culture was the most important factor, followed by practice strength, prestige and compensation, along with several other factors." Respondents note that Bain "set the bar (with McKinsey) in terms of prestige” and noted that the firm was “great for management consulting." In terms of quality of life, one strategy consultant at Bain & Company said of the firm: "There is no other company I’ve seen in my 10 years of professional experience with a stronger, healthier culture." A Toronto staffer added, "It is a demanding career, but yes, I have been able to live a very rewarding personal life over my last 10-plus years at Bain." Boston Consulting Group also received high praise. Said one health care consultant: "BCG is a fantastic place to work. They go the extra mile to invest in their consultants. The work is interesting, the people are brilliant, and the compensation and benefits are second to none." Other smaller, more niche firms that were recognized for their quality of life, include Analysis Group (No. 4), The Cambridge Group (No. 5), Triage Consulting Group (No. 9), Censeo Consulting Group (No. 10), and West Monroe Partners (No. 11). As an example of why these smaller niche firms are succeeding, one senior consultant at The Cambridge Group said, "I feel very lucky to have found TCG. I am constantly challenged and enjoy the work and the people. As a testament to the great experience I have had, I'm the only one of my friends from business school who has not switched companies since leaving school." According to Mr. Dalton, more jobseekers are discovering the benefits of joining these niche consulting companies. "These firms often get overlooked in the prestige rankings in favor of the more well-known firms," he said, "but they shine in the quality of life areas that many consultants care most about, leading to some deserved recognition in our Vault Consulting 50 Rankings." "Bain & Company, and Boston Consulting Group for that matter, historically dominates many of our quality of life categories, in addition to carrying a lofty reputation in the industry," added Dalton. "McKinsey, which is perennially the most prestigious firm, slips due to lower firm culture and work/life balance scores areas - where smaller firms tend to have the advantage." View the entire Vault Consulting 50 Rankings for 2011. Browse and apply for the latest management consulting jobs on ConsultancyRoleFinder.co.uk, a leading UK-based job portal for professionals pursuing a career in management consulting. 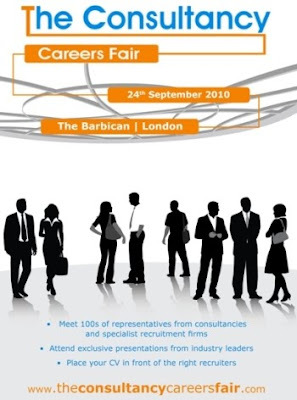 ConsultancyRoleFinder.co.uk is a UK-based job board and career portal for professionals looking to advance their consulting careers and find jobs in the management consulting sector. The job board features hundreds of new consulting jobs daily, ranging from Change Management Consulting, Business Process Improvement, Finance and Healthcare Consulting to Sales and Marketing, Public Sector Consulting and Project and Programme Management. Consulting firms looking to recruit graduates and advertise vacancies on our job portal are welcome to contact our sales team at enquiries@consultancyrolefinder.co.uk at any time.